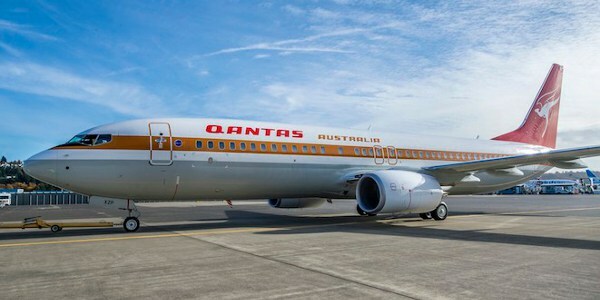 Ahead of the formal unveiling of the Retro Qantas Boeing 737 announced in October, and planned for arrival into Australia in November, the aircraft has been spotted in Seattle conducting pre delivery test flights by local photographers. In attempt to take ownership of the news, Qantas has released an image of the aircraft ahead of the formal delivery. The retro livery celebrates 70 years of the iconic Kangaroo logo. 1944 – The kangaroo was first painted beneath the cockpit of Qantas’ first Liberator aircraft G-AGKT, following Qantas’ decision to name its Indian Ocean passage the Kangaroo Service. The symbol featured on all later aircraft. 1947 – The winged kangaroo symbol was created for the introduction of Qantas’ Lockheed L749 Constellations. They were the first Qantas aircraft to carry the Flying Kangaroo and the first to operate right through to London with Qantas crews. The Flying Kangaroo was later placed in a circle. 1984 – The Flying Kangaroo lost its wings once again in an updated logo and was refined to a more slender, stylised presentation. 1995 – A logo created for the airline’s 75th anniversary year was added to all Qantas jet aircraft. It brought together the Flying Kangaroo symbol and the words ’75 years’ to mark Qantas’ contribution to civil aviation. 2007 – Qantas unveiled a new interpretation of its iconic logo, designed to reflect the changing structure of the airline’s new generation aircraft, and keeping with Qantas’ increasing focus on contemporary design for its in-flight and on-the-ground products. Source: Qantas announced , 8th October 2014. “Our kangaroo logo represents our proud history, inextricably linked with the development of commercial aviation in Australia. It has also become a symbol of ‘home’ to Australians travelling both here and abroad,” Qantas group executive for brand, marketing and corporate affairs, Olivia Wirth said in last months press release. The “home” message is further illustrated by the recent television and print marketing campaign. See the full resolution images (above) by Flickr user 8thnotchphotography spotted . The aircraft has been named “James Strong”. Strong was the CEO of Australian Airlines (TAA) from 1986 to 1989, and served again as the Chief Executive and Managing Director of Qantas between 1993 to 2001. He was later appointed to the Qantas Board. He died on the 3rd of March 2013 following complications from surgery. The Boeing 737-800, registered as VH-XZP (SN 44577), will be the 75th Boeing 737-800, and the last B737 on order, to join the Qantas fleet. “James Strong” will depart Seattle on Monday November 17th and arrive at Sydney Airport’s T1 terminal on Wednesday November 19th around midday.